Nontrivial Games: Strategy guide for SubaraCity, or how to achieve a score above 200 million! First, three terms I'll use often. Region: two or more colored tiles joined together. Mayors: the guy with the bowler hat, you use them to destroy isolated tiles. Cycles: a convenient way to divide a game into smaller parts. A cycle starts when you build a golden tile and ends with the construction of the next one. Always scan your possible moves from top to bottom. Be disciplined, one small error can put you in trouble later on. Once you have a blinking region that can be merged to a level-10-building, wait, don’t always merge it right away. If you can do a bigger region easily, do it. It is a good idea in general. Sink: this picture shows what I call a sink. The picture was taken just after a merge was done, and immediately a colored tile will fall where the yellow arrow is. Observe that for any tile that is dropped, the sink can absorb it. If a light-green tile is dropped, then you have to merge the dark-green pair first. This is the weakness, because if the first tile that drops is a grey or brown tile, then your sink will be clogged. If the tile below the sink is grey or brown then the sink will be a bit more resilient, but nevertheless a weakness will remain (as it should). Sinks can vary quite a lot but when you find one exploit it. If you have a choice, try to bring new tiles one row at a time. If you do this it is easier to match them. In other words, most of the bad things that happen, happen because a horrendous combinations of tiles falls in a hole of two or more that was left after doing a match. This is an important concept and applicable in many situations. For example we just saw it as the weakness of sinks. What is the best place to stack level-10-buildings? Well, I believe that the best place is the bottom row. If possible complete the bottom row before filling the next one. The next best place is to build them on the sides and as connected as possible. So, ideally the level-10-buildings should connect in a U-shape. What is the worst place to stack level-10-buildings? Never, never, never pile level-10-buildings in the middle of the board. This splits the available space in two areas, and everything starts to clog very fast. Don’t use mayors at the end of a cycle, normally you just waste them. It's better to use them during the middle section of each cycle. There is a skill that one can learn of "knowing" when it's a good time to use a mayor. As a rule of thumb, after using a mayor at least two new merges should be possible. Learning how to use mayors effectively is probably the most important skill you have to develop. If you want to get very high scores then your first objective is to improve your skill until you are able to earn more mayors than the number of them that you use in each cycle. So you need to consistently have a net profit of mayors in each cycle. You should have a net profit of 2 mayors or more. Most of the time you will want to destroy the golden tile you just constructed at the end of the cycle (you can wait for a good time to destroy it, of course). Remember that space is very valuable. After you feel confident with the bullet above you have to go through many cycles and collect a lot of mayors (I think that the game does not allow more than 99 mayors). Then the next step is to try to build the highest possible building, using all your mayors. 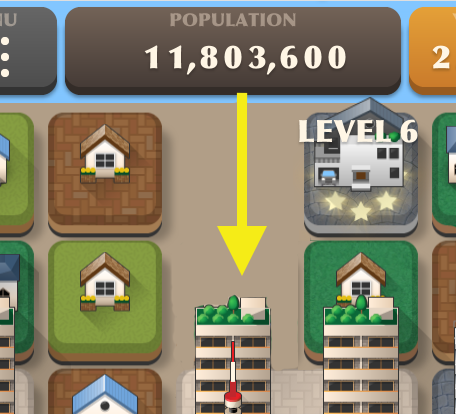 For example, with 15 mayors I was able to merge 21 level-10-buildings and obtain a level-30-building worth 95 million points (that is my record). Of course your mileage may vary. When you are satisfied with a high level building you preserve it and go for the second one in the same way as described. Of course you will have less space so probably your next building will be of a lower level. With these strategies and patience you will be able to beat me! Acknowledgement: I thank Nicola Salmoria for his help on writing these posts about SubaraCity. And also thank him for letting me write in his blog! ©2015 Roberto Canogar. Unauthorized use and/or duplication without express and written permission is strictly prohibited. Excerpts and links may be used, provided that full and clear credit is given to Roberto Canogar and nontrivialgames.blogspot.com with appropriate and specific direction to the original content.